Are you ready for a wild Halloween? Then you need a crazy costume for this year. Something that says, you’re more than ready to kick things up a notch with a little bit of raiding and pillaging. Well, in all of history we’d have to say there is one group of warriors that were experts in exactly that. We are, of course, talking about the Nordic Armies from the Viking Age. 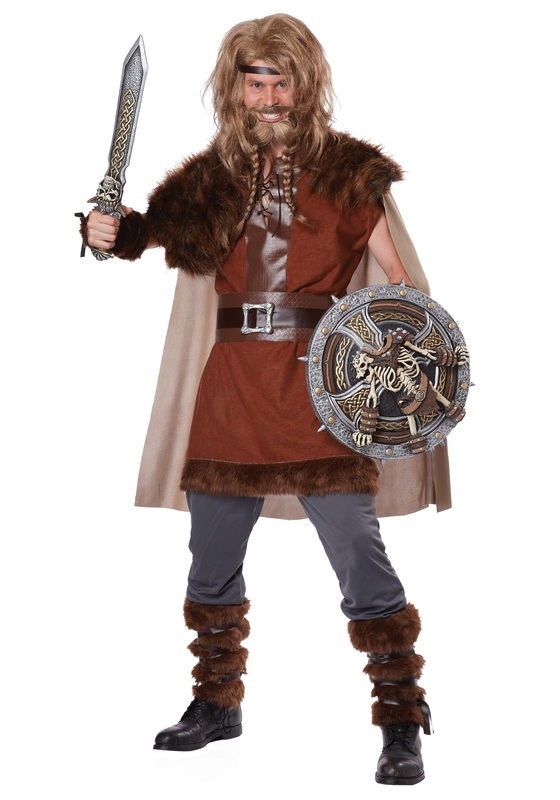 Go out this year wearing this Mighty Vikings Costume for men and you’ll be sure to have a legendary Halloween. Once you throw on these battle-ready duds, you’ll look ready to sail across an ocean if it means procuring that which you desire. Whether it be silver and gold or hot wings and a sixer, we have full confidence that you won’t have a problem obtaining it. Although this costume is a great start to your Nordic transformation, it may move things along faster if you grab a few accessories as well. You need to make sure you are properly equipped for Viking activities and that means having the right weaponry. Decide whether you’re more of a sword guy or a battle-hammer guy and take a look at what we have in stock. After that you just need the burly beard and long untamable head of hair to complete this mighty costume. If you want to go all natural and grow it out yourself, more power to ya, but just know we are here to help! We have plenty of wigs, beards, and combos of the two that you can take a look through.